Preheat pan or griddle to medium heat. I have a gas stovetop and I put it to marking “6″ if that helps. Lightly coat with cooking spray. Mix dry ingredients (flour, sugar, baking powder, baking soda and salt) in a medium sized mixing bowl. In a separate bowl whisk together buttermilk, milk, and eggs. Right before you’re ready to begin mix the dry ingredients and wet ingredients until just combined. Do not overmix. 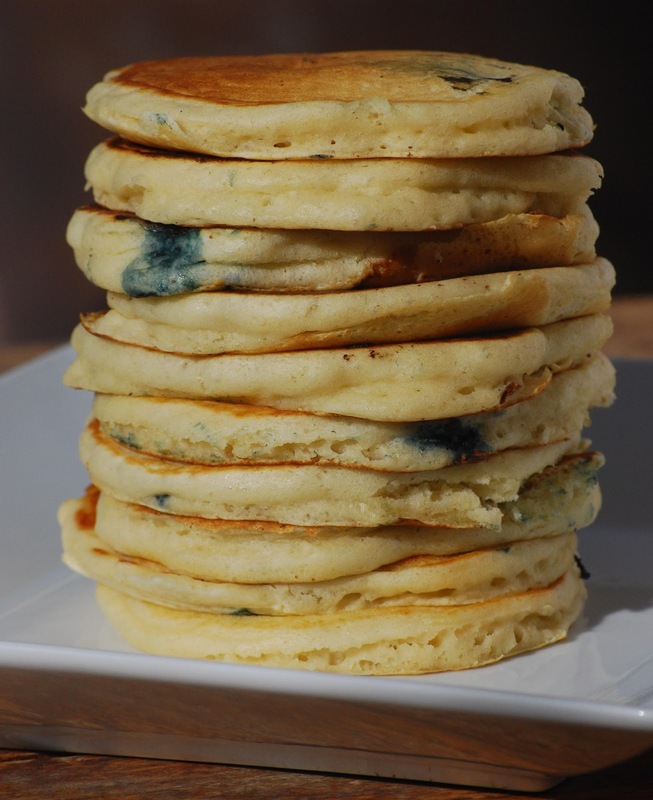 Pour about a 1/4-1/3 cup of batter for each pancake. Add desired amount of blueberries and lightly press them into the batter. Once the batter starts to make air bubbles, flip them over carefully. Cook until golden brown on both sides. If you’re really fancy, you can keep them warm in an oven at 250F.